Making Egyptian Bracelets Using Bright Vibrant Colours and Shiny Gemstones! 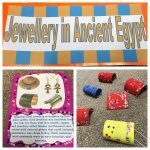 During History, Key Stage 1 children have been learning about Ancient Egyptian Jewellery. During this time, Jewellers were skilled craftsmen. The jewellery was beautiful and colourful, and was made out of copper and gold wire, gemstones, coloured glass beads, and colourfully painted clay beads. Wide collars were popular, as were rings, earrings, and bracelets worn at the wrist, upper arm and around the ankle. Jewellery was used for adornment, social status, and protection. The children have enjoyed making their own Egyptian bracelets using bright vibrant colours and shiny gemstones!